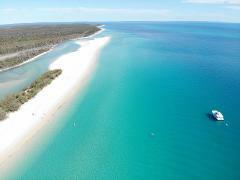 Cruise with Whalesong across to Fraser Island's pristine, secluded western beaches. Swim, kayak, fish, walk, ride inflatable, relax. Marine life regularly seen while cruising. Morning Tea + Aussie BBQ Lunch.